I think Savannah, Georgia wins for one of the prettiest cities we’ve visited in the US. Everything from the cobblestone streets, to the historical architecture, the Spanish Moss draped trees and beautiful parks, it’s amazing that it’s taken us this long to visit. We stayed at the amazing Montage Palmetto Bluff, located about 30 minutes outside of Savannah. We stayed there with the hopes of being able to drive into the city and explore, then head back and get in the pool afterwards. Our plan worked out perfectly, we reached a peek of needing to cool off on the first day (woah- definitely felt like I’d done hot yoga 3x in a row at one point!) but we knew we were close enough to come back for more the next day. Before arriving in Savannah we knew of two spots we wanted to make sure to visit, Forsyth Park and Jones Street. Thomas found a parking spot at the north end of Forsyth Park on Bull Street, which is where we began our tour of the city. As it turns out, we got really lucky with Bull Street being a fantastic spot to walk down because you’ll hit a new park every few minutes. The first park we came across was Monterey Square, a quiet park with lots of hydrangeas, tall Spanish Moss covered trees and the Pulaski Monument. It’s also surrounded by some beautiful homes including the Mercer Williams House, which now acts as a museum. I’ve never experienced a combination of heat and humidity like we did in Savannah. It was on another level that day! On the radio they said it was 94 but felt like 113 because of the humidity. We stocked up on water bottles and popped into a few places to cool off with some iced tea at least a handful of times. Regardless, we loved walking around the city, which felt relaxed and quiet even though there we lots of tourists (mostly in horse drawn carriage tours). I wore this silky Pankaj & Nidhi dress that I bought from Anthro (I’m just in love with the print and mint color!) paired with my favorite pink Mansur Gavriel bag. Next up was Chippewa Square, most famous for being the park in which Forrest Gump sat on a bench and told strangers his life story. We had done a bit of research ahead of time and found a chocolate shop steps away from the square. We had joked about taking a “life is like a box of chocolates” photo in the park and when we wandered into the chocolate shop (Chocolat by Andam Turoni), we couldn’t resist…the sweets or the photo op! But honestly, it turned out to be the cutest chocolate shop I’ve ever been to. The ornate and intricate chocolates were perfectly displayed in glass cabinets surrounded by floor to ceiling displays of old books, typewriters and love notes, making the whole experience of picking out your chocolates a whole lot sweeter! As the day continued, we made our way north, coming up to Jones Street. We set off walking up and down the street, stopping to take pictures of our favorite houses, which meant we stopped at almost every single house :) When we were walking along Jones Street we met a reader that recommended we go to Collins Quarter to eat. Combined with the multiple emails we got, also suggesting Collins Quarter, we knew just what to do when our stomachs started to rumble for lunch. After a reasonable 10 minute wait, we were seated and itching to order. The food was delicious and particularly light and refreshing considering that it was super duper hot that day. We split the watermelon salad (so good!) and I ordered the smashed avocado while Thomas got the ahi poke tacos. One of my favorite place on earth. I fell in love with Savannah and your photos just make me want to go back! Love your super elegant and beautiful floral dress! Savannah looks so pretty! Love the pretty pastel colors and your dress is so cute! You two visit the cutest places! What a beautiful place!! I’m also obsessed with your bag and dress, simply stunning! Loving the vibes in this post. My family is from the south and there is something really pleasing about the whole aesthetic there. P.s I really love when you wear cute flora dresses, suits you so well! This dress is so gorgeous! You always wear the prettiest dresses and have the prettiest backgrounds. I like these beautiful photos, your look is perfect. I didn’t know Savannah before…such a great place! seriously such a charming city! must visit! Love the colors of your look! Everything looks so pretty! Julia- what is your secret for keeping your hair so beautiful in the heat and humidity??? Amazing pictures and beautiful impressions! Love your cute look, too! The dress is so pretty and the cute bag suits perfect to it! Gosh it’s so incredibly beautiful. The architecture is gorgeous!!!! Such a prett city! The houses are so beautiful! Love your outfit as well, it fit in there perfectly! Love your outfit. It’s definitely heating up so it’s perfect summer weather attire. Savannah looks gorgeous! I can’t get over the box of chocolates photo haha! Wow! Savannah looks so picturesque! The trees are incredible! Savannah looks so pretty! All those beautiful hydrangeas and whimsical old buildings! Beautiful! I love Savannah :) So glad you made a trip out East to our beautiful side of the world! I live in Charlotte, NC so I definitely understand the heat and it’s been quite a hot Summer here in the South!! Dying over those chocolates, that is the cutest idea! Definitely need to stop by there next time I’m in Savannah. Glad y’all had a great time! Never been there before, but these pictures make me want to go. So so pretty! I definitely want to visit Savannah! So cute and charming there! And I love your dress. The pastel color is gorgeous! Beyond gorgeous, Julia! I love this dress on you! Savannah looks beautiful! I passed through there once on the way to Hilton Head Island. It was evening and the temperature was still just as hot as you described! Despite the heat you managed to look flawless as usual! My home town! I’m so glad you liked it. The heat here has been unbearable, but I’m glad it didn’t deter your from coming. Great roundup of your time spent in Savannah! I’ll definitely bookmark this in case we’re ever there. Loving that dress on you–the color is perfect! Savannah is pretty high on my US Bucket List and your photos make me want to go even more! Looks gorgeous! I am loving all the midi dress options you are showing on your blog lately, it’s the length this summer for sure!! So dreamy! I want to go! Beautiful photos! Savannah is on my must-visit list! http://bit.ly/29zWK9W .. my EVERYDAY makeup essentials! What a gorgeous town (and dress!). We don’t get that kind of history out west, so it’s fun to experience it in new towns. Love that purse, too! That chocolate shop looks like a wonderful place to visit. 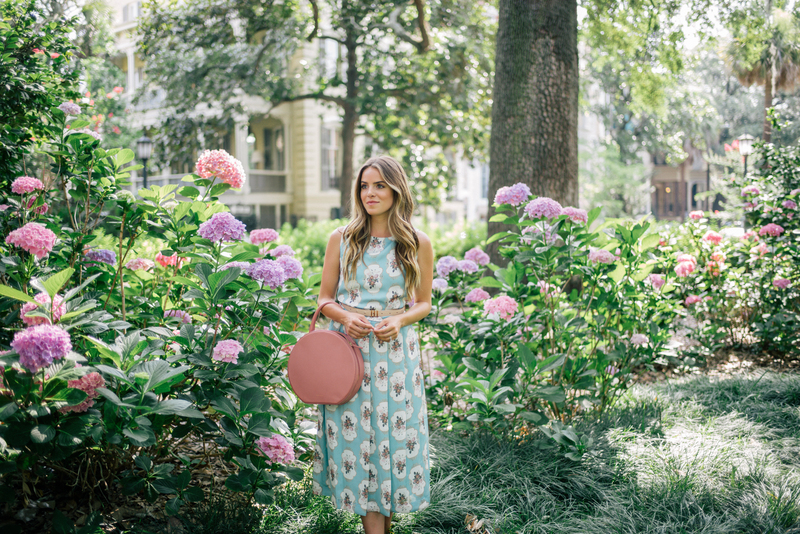 I love the old Southern charm you were able to capture in these photos (especially those hydrangeas)! Love the dress – the pattern is adorable! omg I love that bag with your dress PLUS that pink building?! It really is so very pretty – I nearly died of awe seeing your snaps of the chocolate shop! Lovely dress, Julia! You wear it so well. Especially with that bag…I don’t think I’ll ever get tired of seeing it. The color is perfect. That Mansur Gavriel boxed bag is so so so pretty! Really love it, especially in the shots with the pink background. This makes me want to visit Savannah! That chocolate shop is too cute and it’s on my list to visit when I go to Savannah! I love your dress choice and it fits perfectly with your surroundings! Would you suggest always wearing a belt with it or do you think it would be fine to wear without? Great post! Such beautiful bag! This whole look has like an old vibe too it which is so charming. As a native Georgian it absolutely warms my heart that you fell in love with Savannah. Thank you for showing the beauty and southern charm of Savannah to so many of your readers!! That dress is beautiful! Such a fun bag, too! Savannah is such a gorgeous city! When I lived in Charleston, one of my best friends from high school went to SCAD, so I’d go down and visit a couple times a year! I was just in Savannah a couple of weeks ago! Such a lovely city. Also, love your dress! We’re hoping to head to Savannah in October when it has cooled down some. These pictures have me ready to be there now! Thank you so much! You definitely don’t have to wear a belt with the dress, it looks just as cute without. Savannah looks so charming, I’m so in love! Gorgeous dress!! It fits in so perfectly with Savannah! We were delighted to meet y’all! You inspired us to try the chocolate shop that we’ve walked past so many times, and it did not disappoint. Glad you enjoyed Collins Quarter – we love it! I’ve never been there before. What a beautiful place! And oh my goodness, I love your dress and the hat box!! Gorgeous photos (like always)! You give me such wanderlust. I love Savannah! Your photos make me miss it so much! I never thought I’d want to visit Savannah, Georgia, but it looks like such a beautiful place. Those streets are just so pretty! I love your floral dress, by the way, and that bag is so cute! Absolutely Goreous photos! Savannah is beautiful! Savannah is everything! Will definitely be making a stop at Collins Quarter next time I make it down from Atlanta. Stunning. Please check out my latest colourful lookbook. this is just magical! You look like Alice in WOnderland! Such a beautiful city! Looks so charming. And your look is adorable!! Did you get to experience River Street?! I was just there last night for a bachelorette party! :) Hope you enjoyed beautiful Georgia! I love Savannah and your photography! Did you go to the Pirate House? It’s super cool and kitchy in a fun southern-ghost way. These photos look incredible and I love the combo of the mint green + light pink in your outfit! ? It sounds like an incredible Savannah day! The chocolate shop sounds just darling. WOW! This is so amazing. My husband and I headed to Savannah in two weeks. We have tickets to an All you can eat Crab Fest, but weren’t sure what else we would find. Defiantly will check out The Collins Quarter. Thanks for doing your review! Come check my blog after July 25th for my review. Ok… I have to go now! Gorgeous, as always! What a gorgeous dress, perfect for summer! I have lived in Savannsh all of my 46 years. I live out on the islands but work 2 blocks from Jones Street and run frequently at Forsyth Park. The heat is certainly stifling here. I’m so glad that y’all enjoyed Savannah and your pictures are breathtaking. Too much posing and you have big feet…and why would you eat chocolate in the heat?